The $70 billion Invesco QQQ ETF, tracking the Nasdaq-100 Index, turned 20 years old in early March. Since QQQ launched in 1999, the Nasdaq-100 Index has outperformed the S&P 500 by 1.35% annualized. Growth in leveraged and inverse mutual funds and ETFs tracking the Nasdaq-100 hit an inflection point in 2017, when assets skyrocketed from $3.8 billion to $6 billion. The vast majority of leveraged and inverse funds have a one-day investment objective. Leveraged and inverse Nasdaq-100 funds are investment tools with a range of applications. When we look at the performance history of the Nasdaq-100 since the inception of QQQ, it's clear that it has more juice than the S&P 500. Over the past 20 years, the Nasdaq-100 has had a beta of 1.37 relative to the S&P 500, and the Nasdaq-100's volatility has been notably higher than the S&P 500's at 24.3% vs. 14.5%. Seeking enhanced returns with less cash is a key driver for employing leveraged and inverse strategies, and volatility is a core factor in understanding the returns of these strategies. 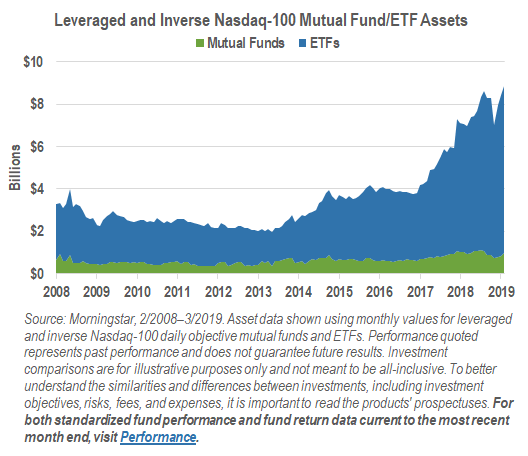 Leveraged and inverse mutual funds tracking the Nasdaq-100 launched in 1998, about a year before QQQ, and leveraged and inverse Nasdaq-100 ETFs entered the market in 2006. The use of these types of funds has expanded greatly since. 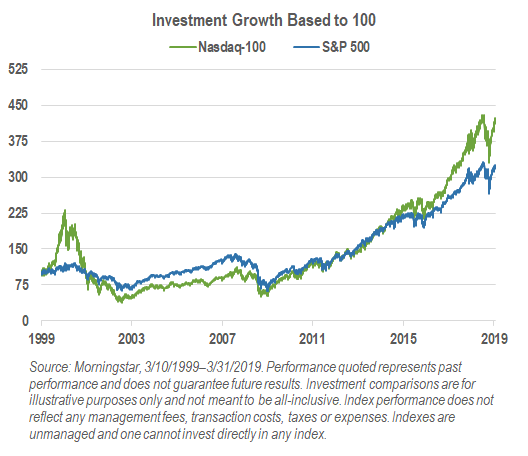 In fact, the growth in Nasdaq-100 leveraged and inverse funds hit an inflection point in 2017. Assets skyrocketed from $3.8 billion to $6 billion, largely driven by a 3x leveraged ETF. Not so coincidentally, 2017 was a year where stocks steadily marched higher with very low volatility throughout the year, as seen in the previous performance history of the Nasdaq-100 and the S&P 500. 2017 was also a notable year for the Nasdaq-100, as the index strongly outpaced the S&P 500 (33.0% vs. 21.8%). The vast majority of leveraged and inverse funds have a one-day investment objective. That is, they aim to provide a multiple, inverse or inverse multiple of the return of a benchmark from one net asset value (NAV) calculation to the next, before fees and expenses. Daily gains or losses in leveraged and inverse funds can affect their net assets and level of exposure to their benchmarks. For this reason, portfolio managers may buy or sell underlying investments in the funds at the end of each trading day to realign the funds' target level of exposure to their benchmarks. The impact of accumulated gains or losses on investments over time, known as compounding, is magnified in leveraged and inverse funds, especially those funds with larger multiples or exposure to volatile benchmarks. Compounding can enhance returns during trending periods (gains are more than or losses are less than a fund's stated multiple times its benchmark's returns), but it can hurt returns in volatile periods (gains are less than or losses are more than a fund's stated multiple times its benchmark's returns). Investors using leveraged and inverse funds over periods longer than a day are encouraged to actively monitor their investments, as frequently as daily. Let's look at how compounding could have impacted a hypothetical 3x daily objective Nasdaq-100 fund in two different market environments. (Please note, this does not account for fees or financing or transaction costs.) In 2017, the Nasdaq-100 returned 33.0% in an upward-trending, low-volatility environment. In this type of environment, compounding clearly enhanced returns, as the hypothetical 3x daily objective Nasdaq-100 fund returned 127.7%. However, heading into 2018, volatility increased and the market experienced a fairly sharp correction from late January to mid-February, followed by a quick V-shaped recovery. Overall, the Nasdaq-100 returned 3.2% in Q1 2018. 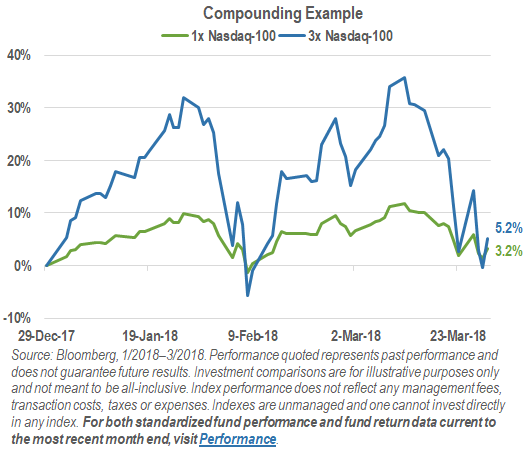 In this higher-volatility, range-bound market, compounding hurt returns for the hypothetical 3x daily objective Nasdaq-100 fund, which returned just 5.2%. Leveraged and inverse Nasdaq-100 funds are investment tools with a range of applications. They can be used to express directional views on the market, to over/under weight this particular market segment or to help hedge an existing position. While there are still reasons to be optimistic about markets and the economy, there is no shortage of risk. With this bull market now over 10 years old, volatility making a comeback in Q4 2018 and the general uncertainty around where markets will go next, hedging with inverse funds may be an attractive alternative to selling equities and potentially incurring capital gains taxes. However, investors should have a comprehensive understanding of the features, advantages, disadvantages and risks associated with leveraged and inverse ETFs before investing, including any fund-specific risks outlined in their prospectuses.